Moreover, I have one request to make. I have on my own part made it my care and study that the things which I shall propound should not only be true, but should also be presented to men’s minds, how strangely soever preoccupied and obstructed, in a manner not harsh or unpleasant. 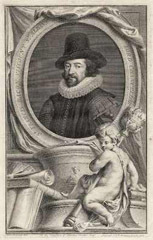 Sir Francis Bacon was an English philosopher, statesman and essayist, a forefather of modern science and a possible author of Shakespeare’s plays. He is also a problematic figure, a man whose political success seemed to be initially slow, despite powerful family connections, and whose spectacular fall from grace in 1621 involved accusations of professional corruption as well as personal immorality. His major scientific works include Proficience and Advancement of Learning, first published in 1605 and Novum Organum, published in 1620. After his enforced retirement from public life he devoted himself to his work, inevitably incomplete because he sought to construct a new method for developing philosophy. 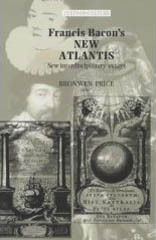 In the 1620s, at the very end of his life, he wrote the Utopian novel, New Atlantis. This was published posthumously in 1627 as an appendage to Sylva Sylarum. Its ostensible purpose was to show how his scientific method of observation and experimentation could be successfully incorporated into society to its great improvement. 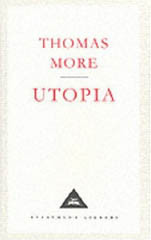 The utopias’ manner was neither ‘harsh’ nor ‘unpleasant,’ but its success in demonstrating Bacon’s ‘truth’ is less assured. Fiction and fact can make uncomfortable bedfellows. Bacon was certain that man’s understanding should be expanded and opened to take in this larger, stranger world. He sought to loosen the cultural ties that bound knowledge of the natural world to philosophical frameworks they might be said to confirm to or fit. He writes in Preparative, ‘The world is not to be narrowed till it will go into the understanding… but the understanding to be expanded and opened till it can take in the image of the world.’ Bacon though that natural philosophers should use inductive reasoning that establishes progressive stages of certainty, namely fact, axiom (or assumption) and law. The premises of an argument are believed to support the conclusion but do not ensure it. The keystone to his philosophical method was an individual’s sensory confrontation with the world by observation and experimentation. Although this went on to become a mainstream philosophical belief, explored by such luminaries as John Locke and David Hume in the seventeenth and eighteenth century respectively, it was still a relatively new idea in the late sixteenth and early seventeenth century. Bacon conceived of the reform of the natural sciences as the great project of his life and explained his beliefs to his educated peers and to posterity in elegant prose. His decision to write his single work of fiction as part of this grand project is harder to understand. Fiction, according to Paul Ricoeur, has the capacity to open up and unfold new dimensions of reality, suspending our belief in an earlier description. This does not seem to mesh with Bacon’s belief in truth, specifically an unchangeable truth that is the same for all men. However, utopias are strange creatures. The concept of perfect societies traces its roots back to the classical world, but it was the Renaissance movement, based on a renewal of interest in this concept, which produced Sir Thomas More’s famous Utopia. Based on Plato’s Republic, it is often quoted as the forerunner of the Utopian genre of literature, which describes an ideal society through the eyes of a narrator figure. This society functions because of an idealised administration, which perfectly controls supply and demand. More also used his Utopia as a vehicle to discuss controversial political matters with some freedom. He appears to have written what we now regard as Book II and some introductory material from Book I first, and then, as a later decision, decided to open up a ‘seam’ in that essentially fictive text, from its title and the names of its character down, a discussion of obvious contemporary application. The resultant text is a hybrid or two different types of telling: that of fiction and that of fact. We had also drinks of three sorts, all wholesome and good; wine of the grape; a drink of grain, such as is with us our ale, but more clear; and a kind of cider made of a fruit of that country; a wonderful pleasing and refreshing drink. The shift from subjective to objective is fundamental to Bacon’s text. In More’s Utopia couples see each other naked before marriage, to confirm subjective desire, which is essential for monogamy and social stability. Bacon, in his only overt engagement with More, instead suggests that a friend of the bride should watch the groom bathing and vice versa. His primary motivation is that the body of each party should be healthy and fit for effective child bearing, something that an enraptured couple may choose to ignore. Bacon affects a shift from desire to observation. This covert engagement with the objective gaze becomes overt in the last third of the book, when the island’s most important institution, Salomon’s House, is described in detail. The house describes its functions as follows: ‘The End of our Foundation is the knowledge of Causes, and secret motions of things; and the enlarging of the bounds of Human Empire, to the effecting of all things possible’. Bacon is clearly ambitious and his fictional scientific institution was cited more than once, in the mid-seventeenth century, as a model for the Royal Society. It was not, of course, the only such model. We have also perspective-houses, where we make demonstrations of all lights and radiations; and of all colours; and of things uncoloured and transparent, we can represent unto you all several colours; not in rain-bows, as it is in gems and prisms, but of themselves single. This description is a long catalogue of Bacon’s aims and aspirations for his grand scientific project. It concludes, unfinished, with an actual list of ‘the wonderful works of Nature, chiefly such as benefit mankind.’ The transformation from fiction to fact is complete, as the text slides into dullness. However, dullness is not really Bacon’s greatest problem. A perfect society, after all, is usually billed as a restrained and sensible place where the highs as well as the lows of society are thoughtfully extinguished. What is more problematic is that Bacon has a witness, lurking, quite literally in the case of the bathing couples, in the background. He seems to suggest that it is only through a witness that the truth about naked bodies – or the naked truth – can be established. This seems to contradict Bacon’s dismissal of testimony as a valid means of producing knowledge. 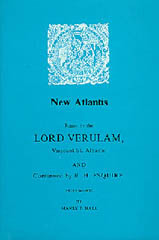 In Preparative he writes with a rhetorical flourish, ‘First then, away with antiquities, and citations or testimonies of authors, and also with disputes and controversies and differing opinions.’ It is in this ‘modern’ spirit that the Royal Society chose their motto more than half a century later, nullius in verba (on no man’s word). Although in recent times the inconsistencies of Bacon’s scientific methology have been challenged and criticised, he is not alone in having to contend with unwelcome testimony. After all, there is always a limit to what one man can experience: only a few people were in a position to notice that a new star appeared in the heavens in 1572. But how do you mange testimony without compromising the importance of personal observation? In practice, I suspect the problem disappeared as natural philosophers of good standing observed, experimented and disseminated their results. The class snobbery of seventeenth century Britain would have prevented too many social ‘mushrooms’ from insisting on the validity of their own observations. In theory, or in factual prose, the inconsistency is more obvious. In fiction, the problem is exaggerated: think of Ricoeur’s dimensions. The Salomon father may be richly dressed and treated like a prince, but he is a man of knowledge, whose earthly riches seem at least a little inappropriate. This is perhaps a twentieth century view, but it is challenging for a reader to view a prince-like character – even an over mighty subject – without certain literary preconceptions. Fiction effectively uses and re-uses well-known images and associations. I doubt a reader, seventeenth century or otherwise, merely sees a man famed for his powers of objective observation. Fiction also has an uncomfortable habit of presupposing an author. An author can insist on his or her authority within the text by writing in a distinct and subjective style. Practitioners of the art of rhetoric favoured stylistic elegance, dialectic and dexterous formula. Bacon rejects this: ‘And for all that concerns ornaments of speech, similitudes, treasury of eloquence, and such like emptinesses, let it be utterly dismissed.’ He favoured an ‘objective’ style that hides his guiding authorial hand and insists on the foregrounding of the story or, more specifically, the validity of observation. It all starts to feel like a game of hide the ‘I’. Bacon writes ‘objectively’ and conceals his own authorial voice as far as possible: his narrator conceals not only his name but also his character, for he never says anything distinctive: the fathers conceal their authority by using the inclusive pronoun ‘we’, and finally Bensalem conceals itself from the outside world as far as possible. Bacon plays a complex literary game that rhetorically denies rhetoric and methodically constructs an image of the ‘sincere narrator’ and ‘objective truth’. The problem with this is that fiction insists on its own fictionality and a reader inevitably looks beyond what is being said to how it is being said and who is saying it. We have consultations, which of the inventions and experiences which we have discovered shall be published, and which not: and take an oath of secrecy, for the concealing of those which we think fit to keep secret: though some of those we do reveal sometimes to the state and sometimes not. When examining nature then, all are equal, some are more equal than others, and natural philosophers certainly more so than most. A possible explanation for this political hierarchy lies in Bacon’s most famous aphorism, ‘knowledge is power’. A consummate politician as well as natural philosopher, Bacon believed that scientific knowledge is indivisible from political power and political power is a competitive reality. He was a keen reader of Machiavelli’s The Prince. Reason may be at the heart of his scientific project, but pragmatism influences his political world-view. The allure of Empire was also starting to influence political thinking. If great explorers like Raleigh were discovering wonders and adding to the sum of human knowledge, they were also opening up opportunities for the colonial acquisition of wealth and land. There was a need for strategy and a strategist, the ‘I’ who would choose what to conceal and reveal. Bacon, a self-proclaimed ‘son of knowledge,’ wrote New Atlantis as a vehicle for his most treasured dreams about scientific enquiry, built over a lifetime and enriched by his early and enforced retirement. His utopia is full of dignity and splendour, enlightenment and knowledge. But he is unable or unwilling to escape from his pragmatic rationalism, his knowledge of the importance of authors and authority. Although Bacon’s literary executor, Dr. Rowley, suggested that New Atlantis is unfinished because Bacon was too busy finishing other, more important projects, it seems just as likely that he simply stopped. There were too many problems and contradictions spilling into the fictional landscape as Bacon’s seam of ‘truth telling’ was compromised, even exposed, by his fictional story telling. Bacon left his single fictional work and went back to observation, experimentation and factual prose. His interest in his grand scientific project remained undiminished and he died, or so the story goes, because he stuffed a chicken with snow to see if it would last longer. The inductive reasoning was good but Bacon died of pneumonia before he could reach a conclusion.